The economy is painfully squeezing people. Churches are no exception. I know three different local churches who have had to release staff members and I have a colleague who recently retired a year early because his church could not afford to pay him. In my own church we have been continually tightening our belts since the economy started declining at the end of 2008. Just this past week we made yet another round of rather hefty budget cuts. No one typically thinks of a lack of funding as a positive thing. However, I have learned over the years that some times when we are in the midst of tough times, we might be right were God wants us. Tough times can be times of refining. Tough times can be times when we are forced to die to ourselves because we aren’t enough to solve our own problems. That is not a bad thing. I asked our elders and our church members to consider the possibility that we are right were we need to be and God is teaching us some very valuable lessons. I point blank asked them how might our financial challenges actually be a blessing. Remind us that we are dependent upon God and can’t do things on our own. Help us focus and prioritize what we do. Help us discover what is most important. Help us purge things that have just become habit and may be aren’t as important as they used to be. Force us us to adjust and get our of our ruts. Make some changes. Teach us to save and be better stewards of the resources we do have. Cause us to be hands-on in ministry that we might have simply written checks to before. Bring us together and build a tighter family/community. Allow us and opportunity to see God’s work. 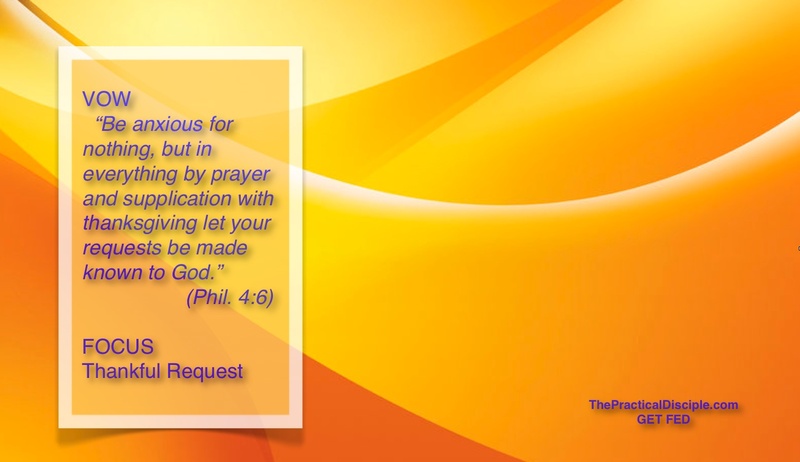 I will be very intentional about the requests that I make to God this week, both in terms of content and the quality of those requests. What keeps coming to mind as I ponder this verse is that God truly wants and expects us to call out to Him. Like a loving parent, God wants to hear the concerns and desires of your heart. That said, my focus will be on being very specific in the requests that I put before God and making sure that all that I ask is done so from a place of great appreciation. The graphic above is a mini-version of a desktop I created for myself as a constant reminder of my VOW and focus for the week. Feel free to download it by right clicking here: Free Desktop for Week 4.